When money is tight, holidays and birthdays can be difficult, but I've found that homemade sweets make excellent gifts that people really enjoy! And all it takes is a little time, creativity, and packaging to make them look cute, too! 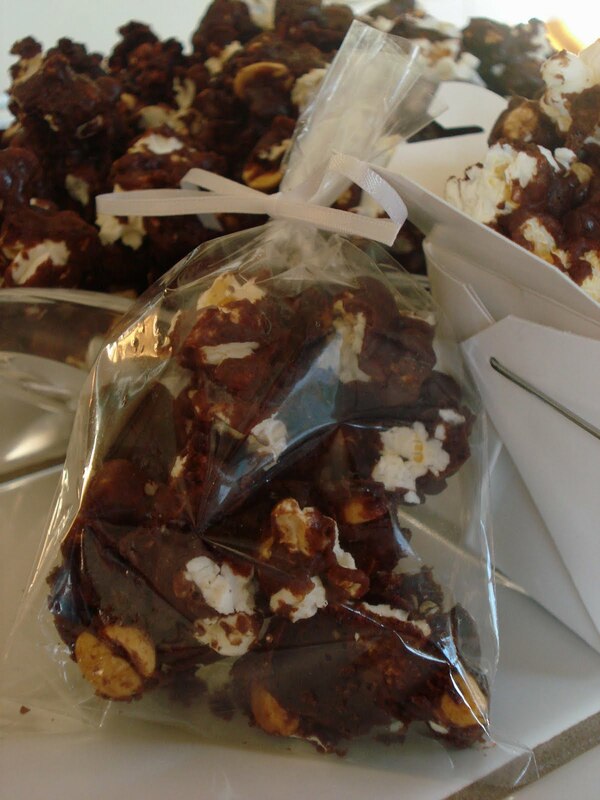 Chocolate-Caramel Corn is a great gift for those with a sweet tooth! With Sumiko's homemade microwavable popcorn, this is a very easy and inexpensive gift to make. Spray a jelly-roll pan with non-stick cooking spray. Combine popcorn and nuts in large bowl. Bring chocolate, sugar, corn syrup, and butter to a boil in a medium saucepan over medium heat, stirring constantly. Reduce heat to medium-low and simmer for 5 minutes, continuing to stir constantly. It is important to stir this while it's cooking, because the sugar can burn easily. Remove from heat and add baking soda and vanilla. Note: I've made this with and without baking soda, and Sumiko and I both think we actually like it better without the baking soda. 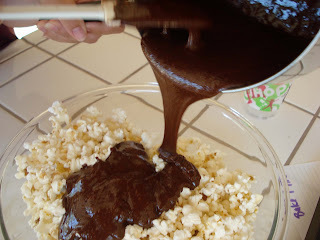 Pour chocolate mixture over popcorn and peanut mixture and gently fold to combine, being careful not to crush the popcorn. 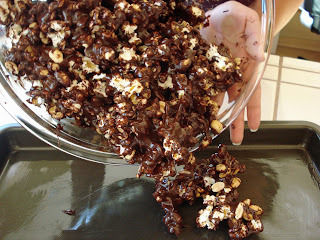 Pour the chocolate-covered popcorn into the prepared pan and spread evenly. Bake for 1 hour. Once the popcorn cools, break it into small pieces. If you're giving it as a gift, there are several ways to package it. 6. Be creative! The possibilities are endless! I love burritos!! There are many ways to fill a burrito: beef, pork, chicken, beans, rice…. 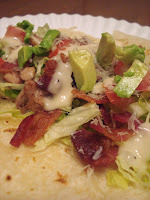 Not to mention all the possible topping combinations: cheese, sour cream, salsa, hot sauce, tomatoes, lettuce, guacamole, olives…. Five days ago (July 24), I started making my new favorite kind of burrito: baby burritos!! The filling is 9 pounds, 2 ounces of April Lily. 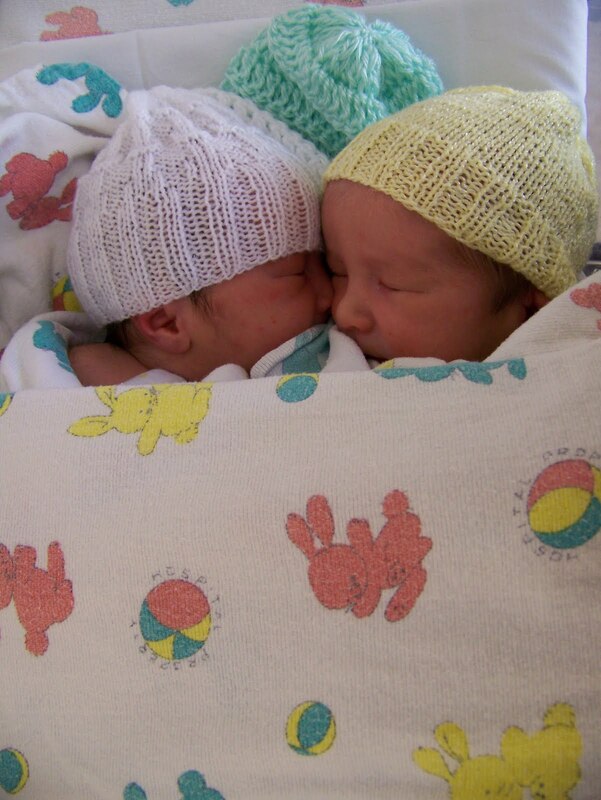 The hardest part about making baby burritos is wrapping them tight enough so the filling doesn’t leak out. The key is to start with a large, woven “tortilla.” Many tortillas that are labeled “swaddling blankets” are made of knit fabric and/or are too small—avoid these when making baby burritos. First, fold the tortilla in half, corner to corner, and lay it out on a flat surface. Place your burrito filling in the center of the resulting triangle, with just a little spilling out the top. Using one hand, secure the loose parts of the filling. With the other hand, tightly fold the right side of the tortilla over the filling. 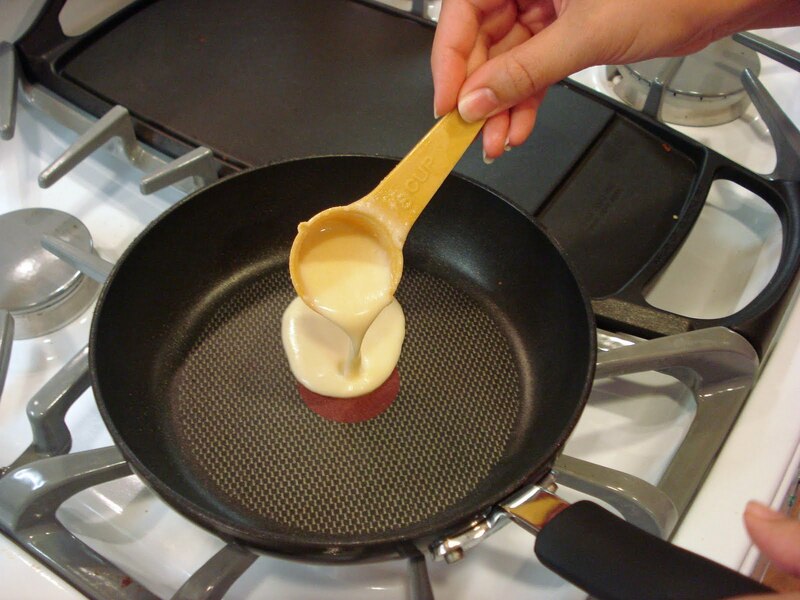 It is imperative to get this fold tight or the filling will not stay in. Roll the contents of your burrito on its side and tuck the end underneath. Firmly fold the bottom of the tortilla over filling. Lastly, tightly fold the left side of the tortilla over and around to complete the baby burrito. While this is the only filling I am currently using for these types of burritos, any filling from newborn to a few months old will do. In the past I have successfully made these with other fillings. Popcorn became a popular snack in America during the Great Depression because it was so cheap—and it still can be!! The key to making popcorn cheaply, is not buying pre-packaged versions of popcorn (pre-popped, microwavable bags, stove-top pans, etc.). It is just as easy and much cheaper to buy plain popping corn and pop it yourself (I buy mine from the bulk bins at WinCo). 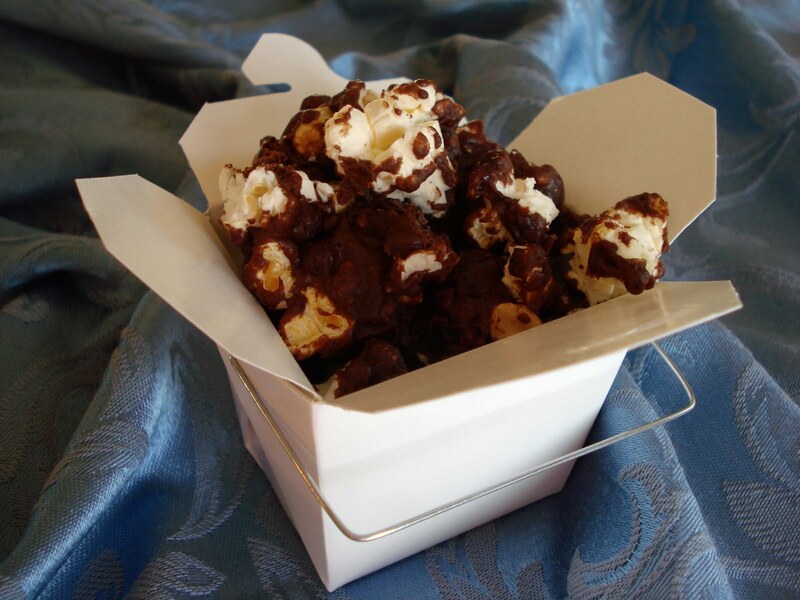 It is even possible to make homemade microwavable popcorn! I used to have an air popper, but it was bulky and took up more room in my cupboard than it was worth so I got rid of it. I can honestly say that I have not missed it once! 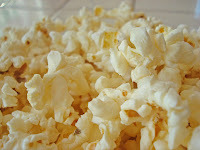 I now pop popcorn in the microwave with the same oil-free results. 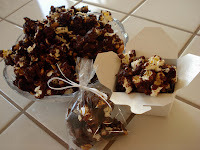 This plain popcorn is the base for Kimiko’s yummy chocolate caramel corn (to be posted later). Simply fill a paper lunch bag with popcorn kernels, fold the top down, tape it shut, and microwave! Place kernels in paper lunch bag and tape shut. Microwave 1 minute and 30 seconds to 1 minute and 45 seconds, listening for popping to slow. Yields about 4¼ cups. Total cost: about 3¢, including the cost of the bag. Follow directions for plain microwave popcorn. Drizzle desired oil over corn before or after popping. Salt as desired. Before microwaving corn, melt some butter in microwave. After popping corn, drizzle with butter and salt as desired. To give your homemade popcorn more of a professional-quality taste, you can purchase popcorn salt, which has been ground to a very fine texture. Pickling salt is also finely ground and can be used in place of popcorn salt. Make oiled microwave popcorn; do not salt. Add desired powdered seasoning to bag and shake to coat. Suggestions: cheese powder, parmesan cheese, taco seasoning (pictured below), chili powder, ranch dressing mix, etc. The best way to save money on produce is to buy it while it's in season locally. It used to be that you could only buy produce when it was in season, but with modern technology and transportation, it is possible to purchase just about any type of produce all year. When you buy produce in the off-season, you are not only paying for the produce itself, but you're also paying for the cost of having it shipped from another country. Additionally, since it comes from such a great distance, it is not as fresh and tasty as local produce would be in season. One thing I love about summer is all of the summer berries. 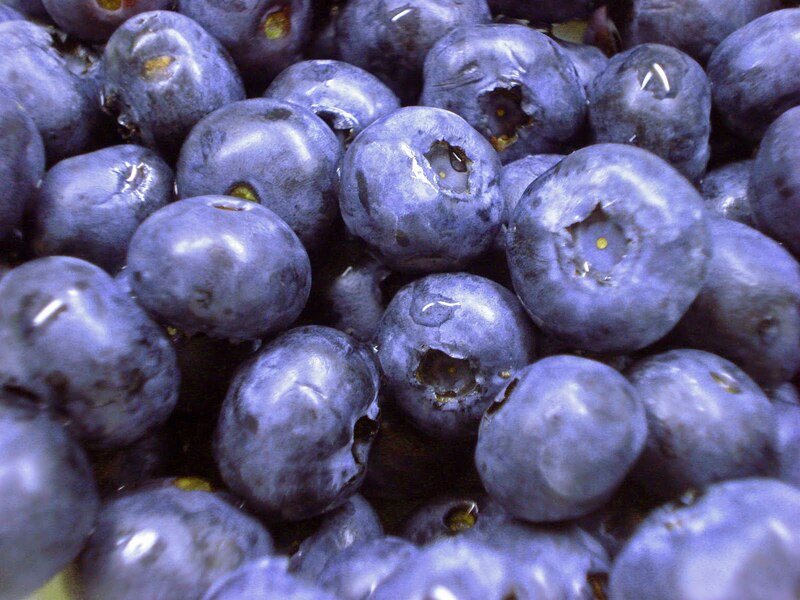 While berries tend to be some of the more expensive fruits, I've found that stores often put them on sale for less than $1/lb - which is my buying price for produce. When I can get berries on sale, I enjoy making crepes. I used to occassionally make crepes for dessert. However, I sort of forgot about them for a while until I saw them highlighted as the recipe of the day on allrecipes.com. We were visiting my husband's large family (22 people to be exact!) of which each member has their own unique likes and tastes. That's why these were such a great dessert for us - they allowed each person to customize their dessert to their liking. And all the kids had a ton of fun assembling their masterpieces! Place all ingredients in a blender and cover with lid. Mix in blender for 5-10 seconds, or just until mixture is combined. 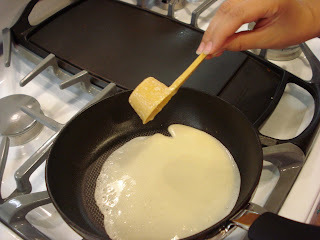 It is important that you do not overmix the batter, as mixing too much will over develop the gluten in the flour, making the crepes very tough and chewy. 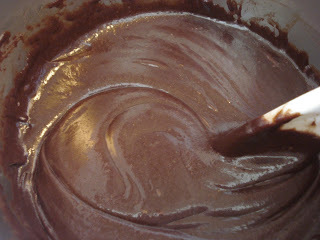 Let the mixture rest in the refrigerator for one hour. Heat a nonstick skillet over medium-low to medium heat. 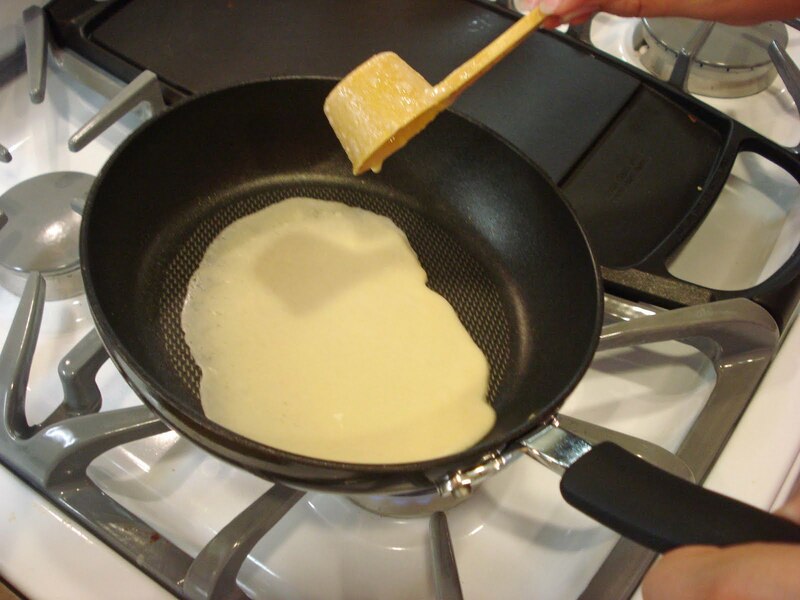 Pour enough batter to cover the bottom of the pan. Tilt pan to ensure that the entire bottom of the pan is covered in batter. After a minute or two, they will begin to looka little dry. At this point, carefully flip it over. The second side won't take as long as the first side. 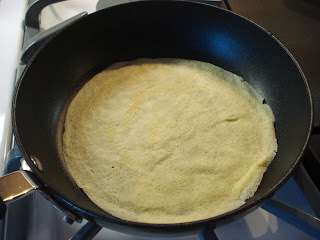 Cook just until the crepe begins to brown a little bit. 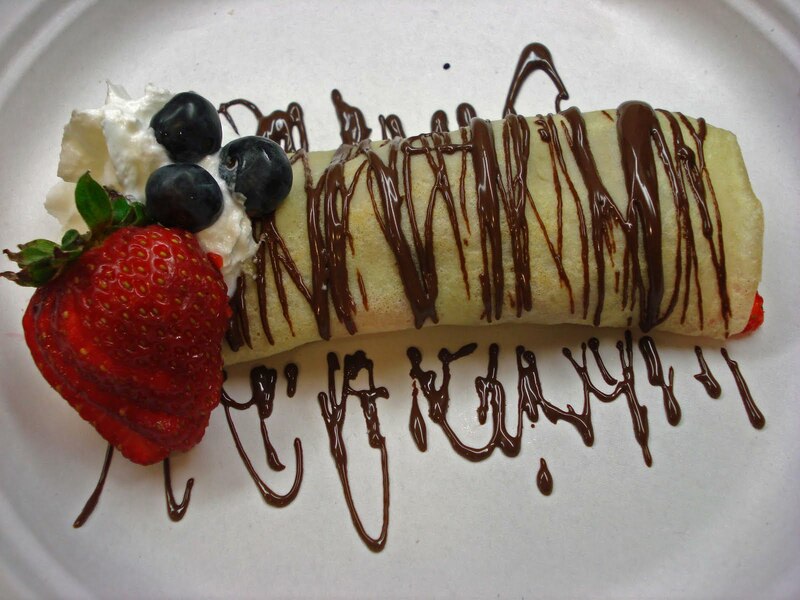 Fill the warm crepe with desired fillings, roll up, place seam-side down, and add desired toppings. Below are some suggestions for crepe fillings/toppings. 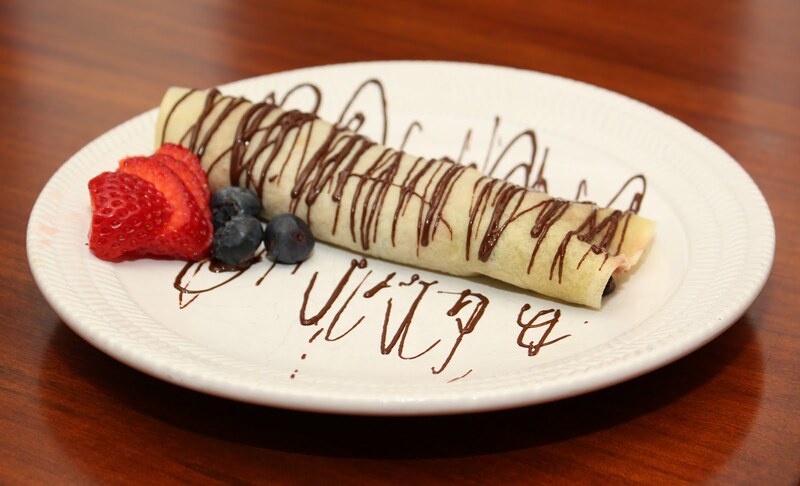 You can customize your crepes based on preference, what's on sale, and what you already have in your pantry and/or refrigerator. The crepes can be made ahead of time and frozen. I placed a sheet of wax paper between each crepe, wrapped them all in saran wrap, and placed them in a zip-top bag before freezing. To defrost, I put the whole stack of frozen crepes in the microwave until they were thawed and warm. Since I try to make a lot of our dinners with little or no meat, I have to rely on other sources of protein. Eating beans and rice together is a great way to get a meatless complete protein. I always start with dried beans rather than canned. Dried beans are cheaper than canned beans because they require less processing, the packaging is cheaper, they are not transported in water, and they do not spoil as quickly. Not only do canned beans cost more, but they also have added salt and, sometimes, sugar. Last week I bought a 15.25 oz. can of S&W kidney beans for $0.68. They cost a lot more than my home-cooked beans and have 4 grams of added sugar per ½ c. of beans (that’s about 1 tsp. of sugar per ½ c. beans!). Cooking dried beans is very easy to do. Some people will say beans need to be soaked before cooking. While this does reduce the active cooking time, I have not found that it is necessary. I used to soak my beans overnight and then cook them on the stove for two to three hours. Now I just toss them in the slow cooker and let them cook on high for about six hours. I generally do not add any seasonings to the beans so that I can season them later when I use them. That way I can make a big batch of beans, freeze it in usable portions, and use it for all different types of dishes. Place beans and water in slow cooker. Cook on high for about 5-6 hours, or until beans are tender. Cooking time will differ with different types of beans. Yields 13½ c. cooked beans. Total cost: less than $2. *Note: Red beans and kidney beans can contain toxins that are only destroyed at high cooking temperatures. These toxins cause stomach cramps and vomiting that usually resolves within a few hours without medical attention. While there have been no documented cases in the United States, there have been a handful of breakouts in the United Kingdom. Be sure your slow cooker reaches near boiling. We like eating beans with brown rice, and we always add corn. 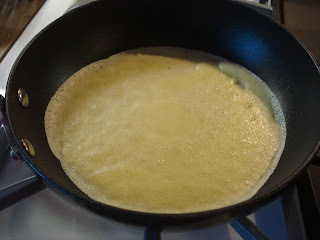 Heat flour tortilla in skillet over medium heat. Top with beans, rice, corn, cheese, sour cream, lettuce, tomatoes, and hot sauce. Layer rice, beans, and corn in bowl. Top with cheese, sour cream, tomatoes, and hot sauce. One of Robbie’s favorites! Place tortilla in skillet over medium heat. Add beans, rice, and corn to one half. Cover with good amount of cheese and fold tortilla over. Flip quesadilla when first side starts getting crispy. Serve with sour cream and/or guacamole for dipping. Add scrambled eggs to bean and rice burritos. As I’ve said before, I generally try to use little or no meat when preparing meals. It is very rare that I serve meat as a main part of dinner. One exception is Great Grandma’s baked chicken—first served to me by my Great Grandma Katie Weaver. It is a very simple dish comprised of only three ingredients: chicken, salt, and pepper. But the simplicity of the ingredients in no way produces a simple-tasting final product. In fact, the first time I made this chicken for Robbie, he went through all the seasonings he could think of, trying to guess what made it so good. He was flabbergasted when I told him it was simply salt and pepper. The wallet-friendly aspect of this recipe is that is uses drumsticks and thighs (or chicken leg quarters if you prefer). It is very easy to find these cuts for $0.99/lb., but I occasionally find them much cheaper by watching the grocery ads. I believe I paid $0.87/lb. at Raley’s for the drums and thighs that are currently in my freezer. That’s about the same as I pay for a pound of frozen peas! The price was so good I bought about 10 pounds and froze them in usable portions. The higher fat content of the dark meat is essential to the success of this recipe so don’t try to use breasts. Also, the skin keeps in the moisture—don’t remove it before baking. The key to baked chicken that is moist on the inside and golden crispy on the outside is to bake it covered for most of the cooking time and uncovered toward the end. Served with frozen vegetables and a cheap starch such as baked potatoes or rice, this chicken makes one easy, delicious, and very inexpensive meal! In fact, if you serve it with white rice, you can use the leftovers to make chicken fried rice. Preheat oven to 375°. Spread chicken pieces in single layer in baking dish. Season generously with salt and pepper. Cover with lid or tightly with aluminum foil. Bake 45 minutes. Remove lid or foil and continue baking for 15-20 minutes, or until skin is golden brown. One way I save money on groceries is by using coupons. With coupons, I'm often able to buy brand name products cheaper than the store brand or even free. When I first started couponing, it was a bit overwhelming and took a while for me to figure out what method worked best for me. The total cost for these groceries was 95 cents with coupons! Regardless of what method you choose, patience is the key to couponing. To maximize the value of your coupons, it is important to pair them up with a sale. That means you don't run out and use your coupons right after you get them. Instead, you hold on to them until there's a sale on those items for which you have coupons. Searching through the ads each week and keeping track of what coupons you have can be a daunting and time consuming task. Thankfully there are plenty of online resources that do the work for you! Couponmom.com is a free site that compiles the grocery sales and matches them up with coupons for many grocery stores in the country. Simply click on "Grocery Deals" at the top of the page. Money Saving Mom is another great resource for matching coupons and sales. You can find a list of all the grocery stores she matches here. I would encourage you to browse those two websites, as they both offer tips and techniques for couponing. I will be writing about coupon organization methods at a later time. After sales, coupons, and rebates, the total for this purchase was $1.90. Additionally, there are many blogs that post great online deals and freebies. Money Saving Mom is one of them, but there are many others, including The Frugal Find, My Frugal Adventures, and Mojo Savings. These websites talk about saving money in general, in addition to saving money at the grocery store. If you are new to coupons, Coupons.com is a great free site for printing coupons. For those in Canada looking for money saving sites, check out Smart Canucks, Frugal Shopper Canada, and Freemania. Many of the sites listed above post freebies and samples. I sign up for as many freebies and samples as I can, because 1) I get products (sometimes full-sized) for free; and 2) the samples often come with high value coupons. One piece of advice I have before signing up for freebies is to create a junk email address. Most freebies require you to give your email address, and creating a separate one just for that will prevent any junk email from filling up your normal email inbox. I got all these freebies in my mailbox one day. 4 Wheat Thins packs, 3 Vanilla Caramel Latte packets, a coupon for a free jar of olive oil mayonnaise, and a coupon for free cream cheese. Although I usually only buy it when it is on sale or clearance, meat is one of the most expensive grocery items I buy. Therefore, in order to keep my food bills down, I try to prepare meals with little or no meat. I replace or supplement the meat with cheaper sources of protein such as grains and legumes or eggs. One dish that my family loves to eat and I love to make is fried rice. Not only is it tasty, but it is cheap and easy to prepare. I often plan to make it a day or two after I’ve made rice and meat for something else then use the leftovers for the fried rice. I cook extra white rice, measure out what I need, and refrigerate it. I also chop and measure the meat I will need. This saves me a lot of time on fried rice night. The key to making fried rice that is not gummy or gooey is using cold rice. This is why using leftover rice is so great. When I don’t have any rice leftover, I make a pot of rice the day before or that morning and refrigerate it until I’m ready to cook it. Another reason this dish is super quick to make is that it uses frozen mixed vegetables. It is possible to use fresh vegetables if you want. Just stir-fry them a little before adding the rice. If you don’t already have sesame oil in your pantry, you might be tempted to omit it or substitute with a different oil—DON’T! A jar of sesame oil is pretty pricey, but you only use a little at a time (I’ve had the same bottle forever), and it gives fried rice its distinct Asian flavor. When I make fried rice, I make a big batch (about 10 cups, you may want to halve the recipe), and I make it in my 12-inch iron skillet. If you do not have an iron skillet, a wok or large frying pan will do. But I would advise everyone to invest in a good iron skillet. Always be sure your skillet and the oil are really hot before adding food. For vegetarian fried rice, simply omit the chicken. For vegan, omit chicken and eggs and add tofu if desired. Heat skillet over medium-high heat and add ½ Tbsp. vegetable oil. Stir-fry eggs until set; cut up and set aside. Heat ½ Tbsp. vegetable oil and stir-fry meat (do this even if it is already cooked). Set aside. Heat remaining 3 Tbsp. vegetable oil. Stir-fry rice and vegetables until heated through, about 10 minutes depending on cookware and stove. Season with salt. Add meat and mix well. Stir in sesame oil, soy sauce, and sugar. Turn off heat; stir in eggs. Yields about 10 cups. Total cost: less than $3.00!!! Note that it cost me less than $3.00 to make about 10 cups of fried rice!! The last time I made it, one batch fed my family of five plus a neighbor and we had leftovers for lunch the next day. We all know that stores clearance items they're trying to get rid of, but did you know that grocery stores clearance meat? While "clearance meat" doesn't sound all that appealing, there's nothing wrong with it; and it is a great way to get meat at a bargain price. It's simply meat that has a sell-by date that is within the next couple of days. The main thing to keep in mind is to either use it or freeze it right away. Most grocery stores mark their meat on clearance on Friday afternoons, so the best time to shop for it is Friday evening or Saturday morning. Many grocery stores have a designated area in the meat section for their clearance meats. A couple Saturdays ago, I was at the grocery store to get a few items, so I headed over to the clearance meat section. I was excited to find chicken leg quarters on clearance for 50% off, making them only 65 cents per pound. I grabbed a pack of five leg quarters for my husband to BBQ. A couple days later, he BBQ'd three of the leg quarters and I stuck two in the freezer. 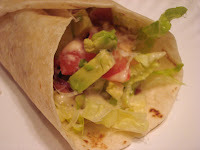 We ate two of the BBQ'd ones that night, and I used the third to make BLT wraps the next night. Bacon is a special treat in our house. There are two reasons I don't purchase bacon on a regular basis: 1) it's usually out of our price range, and 2) it's not healthy. When I can find bacon on clearance or on sale for under $2 per pound, I will sometimes buy it. A couple months ago, I found it for $1.68 per pound, so I bought 3 lbs. and froze it in usable-sized portions. I used a portion of that bacon for these. Layer ingredients on tortillas, filling mostly with lettuce. Wrap the tortillas like a burrito, and serve immediately. I also put a little avocado on mine, since I found a great sale last week! Even though these contain chicken and bacon, they can be made at little cost, because they contain mostly lettuce. One of the many things I love about summertime is homemade lemonade!! And I mean real, homemade lemonade. From lemons. My parents have a lemon tree in their backyard that produces year-around (made possible by the warm California climate). Robbie and I take my 6-year-old daughter, Keanna, out to pick bags-full of lemons a few times each summer. When we get home, Keanna and I get busy juicing. We have a simple electric citrus juicer that makes quick work of it. If you don’t have a lemon tree, lemons from the store will work just as well. Bottled lemon juice will suffice, though there is a noticeable difference in taste from fresh-squeezed lemon juice. Unfortunately, lemons are somewhat pricey at the grocery store. Fortunately, lemon juice freezes very well. If you do not have a lemon tree or know someone who has one, you can buy lemons when they are on sale, juice them, and freeze the juice. I usually freeze the juice in one-and-a-half-cup portions so I can pull it out of the freezer anytime I want to make lemonade. One thing to keep in mind when using fresh-squeezed lemon juice is that the acidity and potency will vary from tree to tree and lemon to lemon. The following recipe is simply a guide that you can adjust to your taste. 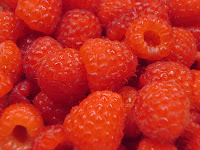 Like it sweeter? Add more sugar. Like it weaker, add more water. Combine all ingredients in a 2-quart pitcher and mix until sugar is dissolved. Serve chilled or iced. Yield 2 quarts. Total cost (if you have a lemon tree): almost FREE!! Excuse Me, Where Can I Find the Toast?